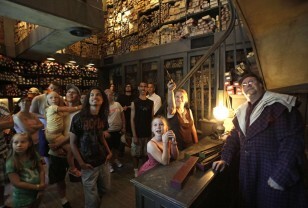 "Harry Potter and the Deathly Hallows: Part 1," the second-to-last film adaptation based on the popular children's books by J.K. Rowling, opened Nov. 19 — earning a franchise record of $125.1 million in the U.S. and Canada on opening weekend. The release of the latest movie is sure to draw fans to the already numerous attractions around the world dedicated to the young wizard. "Some of the best sights are in Oxford such as Hogwart's staircase, the Great Hall on which Hogwart's dining room was modeled and Hogwart's infirmary," said Jason Doll-Steinberg, marketing manager for British Tours Ltd, which offers a popular tour for film locations in London, Oxford and Gloucester. Elsewhere, Seattle's Pacific Science Center is currently hosting "Harry Potter: The Exhibition," which features props from the movies, through Jan. 30. Even the gravesite of one Harry Potter, a British solider who died in 1939, is luring book fans to the Israeli town of Ramle. But relax, Potter fans: That was long before author Rowling was even born. 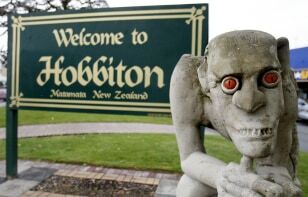 A sculpture of Gollum stands in front of a welcome sign in Matamata, New Zealand. The success of the “Lord of the Rings” trilogy, based on the books by J.R.R. Tolkien and brought to life on the big screen by director Peter Jackson, brought tourists by the thousands to New Zealand to seek out the breathtaking scenery in the movie trilogy about fictional Hobbits on a quest to destroy a ring. Now, Jackson is planning two new movies based on “The Hobbit,” due out in 2012 and 2013, which is sure to revive the tourism industry in New Zealand once again. Southern Lakes Sightseeing operates out of Queenstown, New Zealand, and specializes in "Lord of the Rings" location tours. Their flagship tour is the full-day Trails of Middle-earth, featuring multiple locations, sights and scenes from the movies. 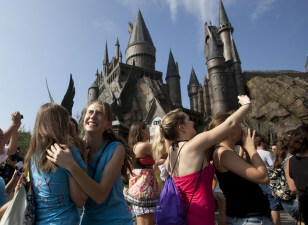 "In the early days, the visitors were clearly hard-core fans of either the book or the movies and the experiences were almost a pilgrimage," said Melissa Heath, who has operated the tour company since 2001. "Some dressed in LOTR costumes and many bought small character dolls to prop up in locations for their photography. Now the clientele seem to have a good grasp of both the books and the movie, and the overwhelming passion and emotion have been replaced with an interest in the scenery and how the movie was made." On the north island, Hobbit fans can take a two-hour guided tour of the Hobbiton movie set, built on picturesque private farmland just outside Matamata. 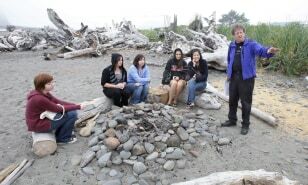 Visitors listen to Michael Gurling, right, of the Forks, Wash., Chamber of Commerce talk about the bonfire location in La Push mentioned in Stephenie Meyer's vampire-themed "Twilight" books. Ever since Bella fell for Edward — and readers fell for the vampire-themed series by Stephenie Meyer — visitors in the tens of thousands have flocked to Forks, Wash. A good starting point for "Twilight" tourists is the Forks Chamber of Commerce. Visitors can get maps, brochures and other information about “Twilight” destinations, including Forks City Police Department, where Bella's father works; Forks Outfitters, where Bella works; and Forks High School, where Bella first meets Edward. At the chamber, visitors can also have their photo taken with Bella’s truck and see a lighted gazebo like the one Bella and Edward danced in at the prom. “We love being the center of the ‘Twilight world,’ ” said the chamber's director, Marcia Bingham. “We have a well-trained staff that speaks fluent ‘Twilight.’ ” Two tourism companies, Dazzled by Twilight and Team Forks, also offer guided tours of Twilight-related sights in the region. Customers place their orders Aug. 9 at the San Crispino gelato shop in Rome. San Crispino was already a must for gelato purists even before being enshrined in Elizabeth Gilbert's memoir, "Eat Pray Love." Fans of the late crime novelist Stieg Larsson learn more about "The Girl with the Dragon Tattoo." Stieg Larsson's best-selling Millennium trilogy was published in 2005 in Sweden, shortly after the author's death in November 2004. The first book in the series hit the U.S. in 2008 and quickly became a New York Times best-seller. The book and the movies — both the originals filmed in Sweden and the upcoming Hollywood version starring Daniel Craig — have fueled an increase in the number of visitors to Stockholm. The Stockholm City Museum expects to conduct 300 tours this year. "The number of tourists from abroad has increased from 10 percent to 20 to 25 percent," said Sara Claesson, head of communications for the museum. The city-walk tour includes a visit to the building where the fictional Mikael Blomkvist lives, the cafe where Stieg Larsson himself used to be a customer, the Millennium office, the building where Lisbeth Salander buys her luxury apartment, and the beautiful scenery of Stockholm. 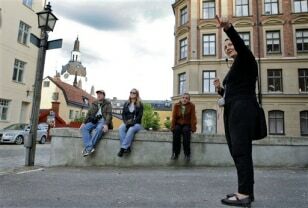 "As Stieg Larsson never describes Stockholm, the guided tour gives you the opportunity to actually see what it looks like on location," said Claesson. "Most visitors are fascinated about the Lisbeth Salander character." The museum also provides visitors with a map of locations outside the city, such as Sandhamn, where Blomkvist had his summer cabin. Shakespeare's Globe Theatre in London is a good stop for fans of the Bard. To visit or not to visit? With apologizes to William Shakespeare, fans of the English poet and playwright are still drawn to England nearly 400 years after the Bard's death. A good starting point for a literary tour is Shakespeare's birthplace in Stratford-upon-Avon. Visitors can stop by the Shakespeare Centre Library, which holds collections featuring Shakespeare's life, works and times and includes original editions of his plays dating from 1623. Stratford-upon-Avon is also home to the Royal Shakespeare Company. Its redeveloped theaters open Nov. 24, with stagings of Shakespeare's works throughout the winter. 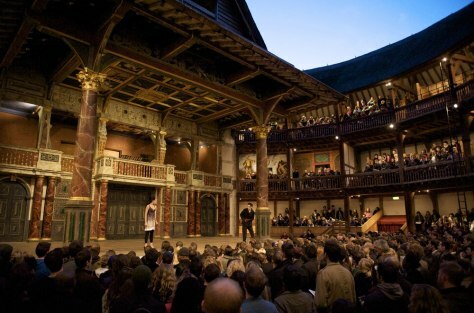 In London, another worthy stop is Shakespeare's Globe Theatre, the reconstruction of the open-air playhouse where the Bard once staged many of his works. The theater season runs from April to October. Book lovers can also download a literary guidebook to London and print maps of walking tours from Get London Reading. "London has made a big effort to create a connection," said Clampet. "London's one of the best. There's so much to offer form Shakespeare to (Zadie Smith's) 'White Teeth.' There's something new every year when it comes to London." >>> looks like the latest harry potter movie is a monster, piling more millions into a franchise worth billions. hollywood.com says it earned $24 million from midnight screenings alone. that puts it third in the record books for midnight debuts. the weekend is just getting started.